March 11. 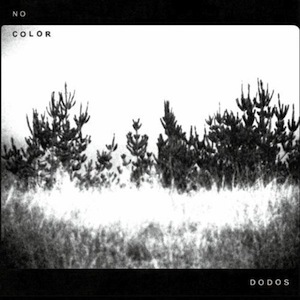 2011 | By Valerie C.
The Dodos are back at it and in great form on their fourth LP No Color. Get ready to be assaulted in the best possible way. The Dodos combo of Logan Kroeber and Meric Long is a match made in music awesomeness. Other members have come and gone, but at the core are Kroeber’s percussion and Long’s guitar pickin’ prowess. Neko Case makes an appearance on the record (always a plus) contributing backing vocals on several tunes. Opening track “Black Night” is where the percussion attack begins, “Kind heart, kindness. Where you going to? Are you going through heaven or hell,” croons Long. Then somewhere in the middle of the record on “Don’t Try & Hide It,” the duo switch it up and suddenly Long’s guitar is front and center. Kroeber’s drumming beat is relentless from the opening track and through most of the record setting a fast tempo. That’s where Long’s guitar and voice comes in, lending balance and focus. Listening to No Color left me unable to control my own body. I was a toe tappin’, head bobbin’, steering wheel thumb drummin’ maniac. And you know what? I bet, you will be too.